OurStage and The New Music Seminar are coming together to launch the "Live at the Roxy" Competition in order to give artists nationwide a shot at performing at Hollywood hotspot The Roxy in Los Angeles, California at NMS 2011. 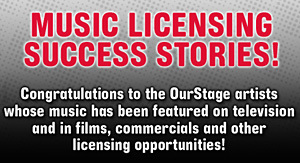 One OurStage artist will be selected from the Top 20 ranked finalists to perform in front of industry heavyweights at the NMS closing ceremonial party on 2/16/2011. In addition to the performance slot, the winning artist will also receive up to $2,000 travel stipend and online promotion through OurStage. Beginning December 13, 2010, all singer-songwriter, rock and pop artists can submit their best original track for consideration. All submissions must be full length with vocals. Entries may not contain any "samples". Artists must own 100% of the rights to the music they submit. Artists must be eighteen (18) years of age or older at the time of entry. Individual artists or a band member must be a legal resident of the 50 United States. Submission materials that are determined, at the sole discretion of the Sponsors, to be classified as rock, pop and singer-songwriter will be eligible. A cable television network is searching for the next country superstar! Indie Rock Artists, Win A Year’s Supply of Free Strings & Accessories From Ernie Ball!